If you’re not using a Microsoft Account to log in to Windows 10, a password reset disk is important . It’s the only the way that will allow you to keep all your stuff in the event you forget your Windows password. The only way to access your computer if you forget your passwords it to create a password reset disk. Of course, you’ll need to create a password reset disk BEFORE you forget your password. It won’t do you any good to create one after you forget your password…capiche? You can use a USB flash drive or a memory card – but remember a memory card only works if your computer has slots for memory cards. If you’re not sure, use a USB flash drive. Here’s how to make a password reset disk (drive) for Windows 10. Right-click the start button, open Control Panel. In Control Panel, click User Accounts > User Accounts > Create a password reset disk. The Forgotten Password Wizard opens. Insert a USB flash drive into your computer. Then click Next. Choose the USB flash drive you just inserted then click Next. Type your current user account password and click Next. 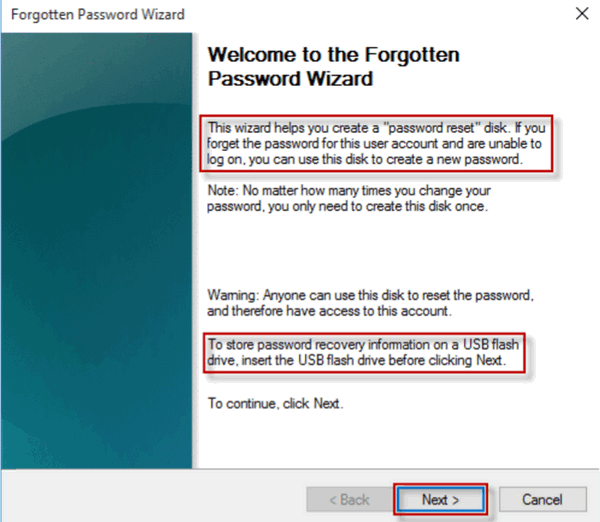 When the process is completed, click Next and then Finish to close the “Password Forgotten Wizard”. Congratulations, you’ve made a password reset USB flash drive In Windows 10. Now be sure you keep it in a safe place – and don’t forget where you put it. Remember, this works only if you are using a local account. If you’re using a Microsoft account, you don’t need a password reset disk (in fact you won’t even have an option to create one if you’re using a Microsoft account). Why is this? Because if you’re using a Microsoft account you can reset your password resetting your Microsoft account password online – this is an advantage we think, that makes it worth using a Microsoft account to log in to Windows 10. I’m confused… in the Password Reset Wizard information it indicates in the “Note:” that you only need to create the disk once, but a couple of paragraphs below in the article it’s stated that if you change your password, you need to create a new disk. I don’t understand. It should have said…if you change your password you should create a new password reset disk just to be on the safe side, even though Microsoft says you don’t need to. In order to prevent confusion, I just removed any reference to creating a new password reset disk even if you change your password. What if you have forgotten your password? Then what would you have to do to create a disk? I have no options under User Accounts to create a Password Reset Disc. My screen does not look anything like yours. I have very little to choose from. I don’t have this option on my computer either. If you’re logged in with a Microsoft account (that is any account using an email address ending in @hotmail.com, @outlook.com, @msn.com, @live.com, @live.ca) you won’t see Create a password disk since you can reset your password online. This is only for those logged in with local accounts. This is only for those logged in with local accounts. 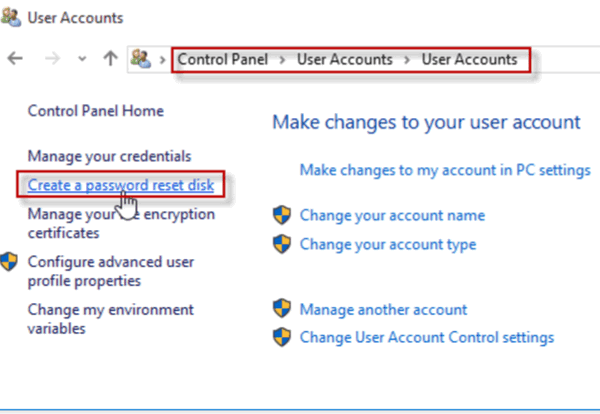 If you’re logged in with a Microsoft account, you won’t have that option because you do not need a password reset disk. If you are logged in with a Microsoft account, you can reset your password online. I have never used a password to access my computer on Windows 10, so I am confused what this is all about. Should I be using a password? Do I have a password? Should I make this password reset disk? You’re not required to us a password. If you don’t use a password you don’t need a password reset disk. We do recommend using a password even if no one else uses your computer. I was locked out of my computer, forgot my password,and it took me 2 1/2 days to finally get back into my computer, but not without going thru lots of hoops to do it. Don’t think I will set my computer any more to automatically log me in, because it’s to easy to forget your password. I could not get past the Lock Screen without password, that meant no taskbar, no anything. Couldn’t even log into my mail account. I didn’t have a Reset Password disk either. In my case I don’t know if a Password Reset Disk would have helped me. I saw on the Lock Screen that I should go to accounts.live.com./password/reset. Didn’t know I need to do this on another computer either. I saw a U Tube video that said that I need to use another computer to put in the link accounts.live.com/password/reset. After going through more hoops was finally able to get password reset, and used new password to get into this desktop. Since I was on the Lock Screen, with no taskbar, I don’t know if a Password reset USB drive would have helped me or not, but I don’t want to go through all the steps I had to just to find out. On Windows 10 the easiest way is to use a Microsoft account to sign into your PC. That way, if you ever get “locked out” of your computer, all you have to do use a phone, tablet or another computer to go to http://www.outlook.com and request a lost password reset. You can then reset the password for your Microsoft account and log into your computer. A password reset USB would have helped you too. Also, changing from a password-based log in to a PIN-based log is a good idea. It’s a lot easier to remember a 4-digit pin that it is a complex/strong password. And the only kind of passwords you should be using are complex/strong passwords.